← How do I choose the right broadband for me? Broadband – How do I find out what broadband is available to me? 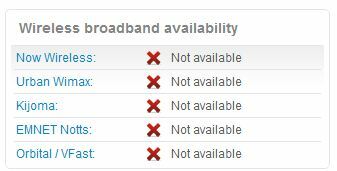 As I said in my last blog there are quite a few varieties of broadband that are available. Regardless of the quality of broadband you might get it depends on which exchange area you are in as to what varieties of broadband you can get in the first place. Exchanges mostly get upgraded according to expected revenue and to some degree need so if you are out in the sticks you are likely to have to wait longer to get the latest services than a dense city area. There are still some areas that don’t get broadband full stop. How far you are from your exchange. The quality of the infrastructure between you and the exchange. This means the cables and joints that the broadband has to traverse. Two different lines of broadband into the same premises can give you different results just because the quality of the cabling varies. Broadband is more sensitive than the voice element on a phone line which tends to work well enough even if the line is a bit crackly. Broadband does not like noisy lines. Whilst the expected broadband service can be estimated it doesn’t mean you will get what is estimated when it goes in. If you are to get an up to 24mbs download speed service it is highly unlikely you will get the full 24mbs unless you live next to the exchange and even then you might not get the full speed possible. So anyway, what can I get? Well, my favourite place for finding out is www.samknows.com. A lot of people in the industry seem to like this site. There is lots of info here but to get to the point I suggest going straight to www.samknows.com/broadband/exchange_search, putting in your post code and clicking search. When your exchange comes up click its underlined name and a screen will come up with lots of info some of which I will now explain (and bear in mind that this is at the time of writing so links etc. may change). 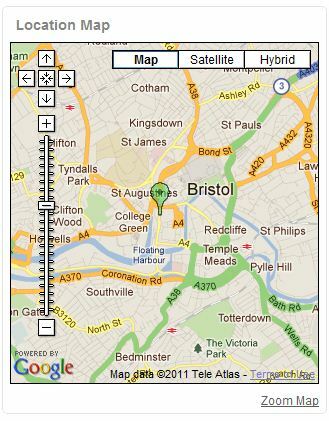 Starting off with the location map to the right of the screen; you can see where the exchange is (green circle with dot in the middle pointing to a location) in relation to your location. If it’s a long way away, say 10 kilometres then you are not going to get the fastest broadband. If you are next door to it then things are looking good. I know it’s obvious but I’ll define it anyway; in the next sections a green tick means a service is available and a red cross means it is not. ADSL: General ADSL delivered using BT’s infrastructure by BT or other ISP’s. SDSL: Again delivered using BT’s infrastructure by BT or other ISP’s. LLU services: Broadband delivered by particular ISP’s who have their own equipment in some or all BT exchanges. More on this below. Cable: This will most often be delivered by Virgin Media but there are other cable companies. Wireless: A generally available wireless broadband network (this does not mean it is free). Now let’s look at the “BT Wholesale information” section. Again these are services that are delivered using BT’s infrastructure by BT or other ISP’s. 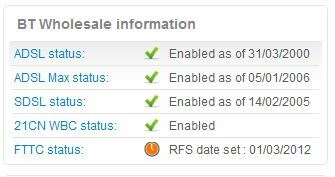 Note that some services have dates next to them of when a service became available or in the case of an “RFS date”, when a service is expected to become available. ADSL status: This is the older up to 2mbs type service, available in this example. ADSL Max status: The up to 8mbs service, available in this example. SDSL status: Available in this example. 21CN WBC status: The ADSL2+ up to 24mbs service, available in this example. FTTC status: The up to 40mbs service, not yet available in this example (at the time of writing) but on its way. 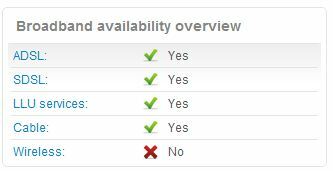 The “Wireless broadband availability” section shows which ISP’s can provide wireless broadband in an area if any. The “Cable Broadband Availability” section shows which ISP’s can provide cable broadband in an area if any. And finally the “LLU operator presence” section shows which ISP’s have their equipment in a BT exchange. It is worth pointing out here that many ISP’s can supply BT broadband and broadband from other ISP’s, for example “ACME broadband” might supply broadband from BT, O2 / Be and TalkTalk. The advantages of LLU are that it may cost less than BT originated services, some services may be available sooner and some services may be offered that are not available through BT. The downside is that LLU services may not be as portable as BT, a small price to pay in most cases. Most ISP’s will want to supply the line, broadband and calls together as a package. Now you may want to see how good a service you can expect to get. There are lots of checkers but I am going to recommend the BT service on this occasion, www.dslchecker.bt.com/adsl/ADSLChecker.postcodeoutput and putting your’ postcode. Please remember that this is an estimate. The result will give you a short paragraph on each type of ADSL that is available. When your broadband has been installed how do you know how good it is? Well before you check, bear in mind that it takes 10 days for some services to settle down to an optimum speed so speeds may be quite erratic until then. The ping speed in “MS” (Milliseconds), anything below 80ms is ok, 40ms or less is good, above 80ms, talk to your ISP. Regard this as either a small bump in the road or a pot hole. Don’t worry that the speeds you get with this are so different to the speeds reported by your router. Ok, that was quite a bit again so I will leave the “how do I choose” section until the next blog. For today’s digression (only a little), if you live in the Bristol (UK) area and you want help with your some­times ‘orrible computer equipment I’m going to recommend a colleague, Matt Clark, see www.bristol-computer-support.co.uk or www.linkedin.com/in/bristolcomputersupport. The great thing about Matt is he can help you with your domestic or business computer equipment without stealing your wallet so to speak or assaulting you with loads of jargon. 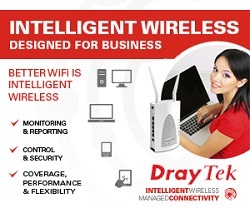 And he knows about Draytek routers too (nudge, nudge – www.iwantrouters.com). what broadband is available to me? � iwantrouters” on my personal internet site. If you are in the UK then go to http://www.samknows.com/broadband/index.php. This may also work for some other countries.